Sudanese President Omar al-Bashir came under mounting pressure Tuesday as three Western nations pushed for a political transition plan following weeks of unprecedented protests against his rule. Bashir, who has ruled Sudan with an iron-fist since sweeping to power in an Islamist-backed coup in 1989, has been battling the biggest challenge of his 30-year-old reign since December when nationwide demonstrations erupted against his government. Thousands of angry protesters chanting "overthrow, overthrow," have taken to the streets of the capital and towns and villages across the country, blaming the veteran leader for the nation's worsening economic crisis. But the protest movement reached its peak on Saturday when the protesters braved volleys of tear gas to reach the country's army headquarters, urging the military's top brass to back them. Protesters late Tuesday were preparing to camp out for a fourth night in a row at the complex, which also houses Bashir's residence, singing revolutionary songs and anti-government slogans. Soldiers meanwhile foiled repeated attempts by the feared National Intelligence and Security Service agents to disperse the demonstrators with tear gas, witnesses said. 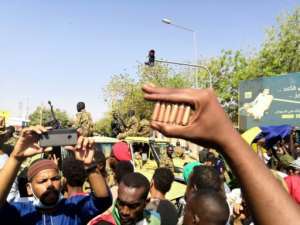 And on Tuesday the United States, the United Kingdom and Norway for the first time threw their weight behind the protestors, calling for a credible political transition plan in Sudan. 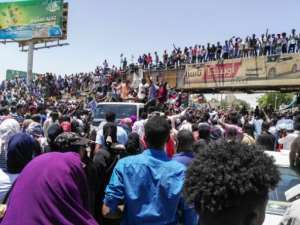 "The time has come for the Sudanese authorities to respond to these popular demands in a serious and credible way," the embassies of the three countries said in a joint statement. Washington had imposed one of the harshest trade embargoes on Sudan in 1997 for Khartoum's alleged links to Islamist groups. The embargo was lifted only in October 2017. 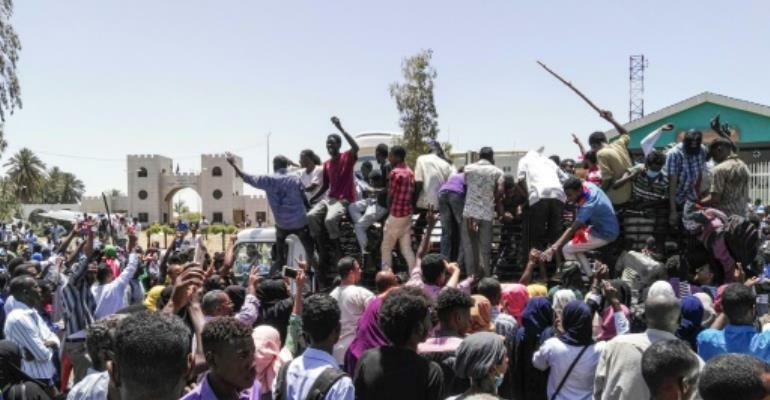 Pressure further mounted on Bashir when the country's police, a key element of security forces, on Tuesday ordered its members to avoid intervening against the demonstrators. "We call on God to preserve the security and calm of our country ... and to unite the Sudanese people .. for an agreement which would support the peaceful transition of power," a police spokesman said in a statement. He added that police had "ordered all its forces" not to "intervene against the citizens or peaceful rallies". The latest demonstration that erupted on Saturday at the sprawling military complex is the largest since the protests were triggered by a three-fold increase in bread prices in December. On Tuesday, security agents twice fired tear gas at the protesters in abortive bids to end their sit-in, protest organiser said. "There was heavy firing of tear gas after which army soldiers opened the gates of the compound for protesters to enter," a witness told AFP. "A few minutes later a group of soldiers fired gunshots in the air to push back the security forces who were firing tear gas." Since the protests erupted, the armed forces have remained on the sidelines even as security agents and riot police have cracked down. The demonstrators have called on the army to protect them from the deadly crackdown during their four days camped outside its headquarters. One photo of a woman dressed in an long white dress, with gold earrings and singing while standing on top of a car on Monday while surrounded by protestors went viral on social networks. Footage obtained by AFP in Paris showed security agents also firing in the air to clear the sit-in on Monday, an operation which had to be abandoned after troops intervened. Troops can be seen firing machine-guns as protesters run in groups, some taking shelter behind army vehicles and chanting "Allahu Akbar (God is Greatest)". Defence Minister General Awad Ibnouf has vowed the army would prevent any slide into chaos. "Sudan's armed forces understand the reasons for the demonstrations and is not against the demands and aspirations of the citizens, but it will not allow the country to fall into chaos," Ibnouf said on Monday, according to state media. Omar el-Digeir, a senior member of the group, said protest organisers had formed a council to open talks aimed at agreeing a "transitional government that represents the wish of the revolution". Bashir is wanted by the International Criminal Court in The Hague on charges of war crimes and genocide connected with the suppression of a now 16-year-old ethnic minority rebellion in the western region of Darfur. He has responded to the protests with tough measures, including imposing a state of emergency, that have seen protesters, opposition leaders, activists and journalists arrested.